UN member states should prepare for great migratory movements, said UN Secretary General António Guterres on 11th of January 2018 during the presentation of the report on the management of migration processes. And this is not a joke: The UN, led by António Guterres, wants to manage and influence migration. All this, of course, is dressed up in pretty words about the need to provide humanitarian aid, and also justified by the benefits that resettlement of the population is to give to the economies of particular countries. However, in fact, this means only one thing: Europe and the entire Western World must prepare for the flood of Africans. Currently, nearly 1,3 billion people live in Africa, and by the end of this century there will be 350% more, or 4,4 billion.1)Africa, Population Pyramid. It is obvious that the continent, whose inhabitants are not able to feed themselves, let alone achieve an adequate level of urbanization and industrialization, cannot cope with such a sharp demographic increase. The UN therefore came up with the idea of resettling Africans to Europe and highly developed countries on other continents. At the end of 2016, just after his election as UN Secretary General, António Guterres said: “We must convince Europeans that migration is inevitable and that multiethnic and multireligious societies create wealth”.2)New UN Chief to Europe: Ignore Voters, Open the Borders, The New American 2016-12-01. It can be assumed here that the goal set by the former UN commissioner for refugees (A. Gutters served this function from June to December 2015), is to promote migration, give it a legal framework and manage it globally. The first major step towards formalization of this phenomenon was the creation of the “Making Migration Work for All” report, which says in no uncertain terms that nation-states are to cease to exist. The document says that migration would be beneficial to everyone. And it is beneficial… to migrants alone (who apart from being accommodated in apartments live on undeserved entitlements) rather than to the average European who has to work to make a living for himself and his family, pay for his home and, additionally, provide for millions more newcomers. The propaganda statement that migration brings social and economic benefits has become so deeply rooted in the media and political rhetoric that some people have begun to believe in it. It is a pity that theses statements are not supported by any calculations or analyses. According to a research4)Migration Terrorism, Project 28. conducted by the Hungarian Századvég foundation, mass migration is perceived by the citizens of all 28 European Union countries as a threat to the EU economy, the heritage of the member states and the presence of Third World aliens is believed to undermine security. The vast majority, as many as 68%, are afraid of the inflow of migrants from North Africa. 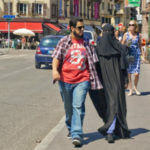 For 70% of the inhabitants of the Old Continent, the growing number of Muslims is a serious threat, while only 8% say that this issue is not a problem. Citizens of European countries are afraid of increased crime and subsequent terrorist attacks. More than half of the pollees think that immigrants come to Europe mainly for economic reasons, that is, they are attracted by a high level of social benefits. 57% of respondents believe that the influx of immigrants from Africa and the Middle East will change the culture of their country, and 73% state that financial support for migrants will be a serious burden on state budgets. 61% believe that the influx of people from the Third World will weaken the EU economy. Also, the International Migration Organization, which participated in the work on this report, states on its Twitter account that „Migration is inevitable, desirable and necessary”.5)IOM – UN Migration, Twitter 2018-04-01. The question arises: who wants migration and who thinks it is necessary? Certainly not the inhabitants of the countries to which the alleged refugees are streaming. the societies of developed countries must become accustomed to having their countries flooded with masses of migrants. The powers that be are trying to convince us of the alleged benefits of mass migration and the resettlement of Africans into Europe. Reality contradicts wishful thinking. Increasingly, citizens of host countries are afraid to leave their homes not to mention that an increased part of their earnings, is used to provide for the newcomers. We have also come to the point where negation of positive aspects of migration is regarded as racism and xenophobia, and to the fact that if someone wants to live in a one-nation state, he is labelled as a nationalist, with the word being unjustifiably negatively charged. A mass inflow of the so-called “refugees” on the Old Continent is not perceived by its inhabitants as a phenomenon that h culturally enriches and will also have a positive impact on the economy. However, global organizations do not take this into account and enforce their own plan to create a nationally and religiously heterogeneous society, where tradition and cultural identity are not desirable. António Guterres and the UN better know what is good for western nations, ignoring the data presented by many organizations, including the Gefira Foundation, which underline a number of negative phenomena caused by the mass flooding of Europe by Third World populations. Guterres has a little bit of a problem with his radical idea, because it is in direct contradiction with rights of Europeans guaranteed by the very organisation he represents, the UN. European identity is not a migrant identity, european culture is not based on mass immigration from Africa or Asia. Europeans have the full right to preserve and protect their culture and heritage and they have UN to back them up. Now it´s up on Guterres to guarantee the rights of Europeans. As a social scientist, it is an understatement to say that, I am agog at the incredible ignorance embodied in the externally dictated ‘invasion’ of Europe by masses of immigrants from grossly disparate cultures. This well intended but grossly naive & ill conceived agenda is absolutely destined to catastrophic & massive failure for all involved, the immigrants and the indigenous peoples of Europe. Yes, I vigorously endorse Article 8 of United Nations Declaration on the Rights of Indigenous Peoples ! Why do you have so much hate in your heart? Have you ever try to talk with one of those refugees or migrants to hear their story? You really think someone is whiling to risk their life in a boat to cross the see, with the whole family, just to find some pleasure on sitting and doing nothing in their “giving apartments”? They do not come with their whole family. 90% is male in the age-group of 20-30. Unemployment is extremely high. In the Netherlands, nearly all sub-Sahara refugees are on social security according to official statistics. That is not the question,the question is that too much of anything being bad,can’t migrants choose less crowded continents than Europe?